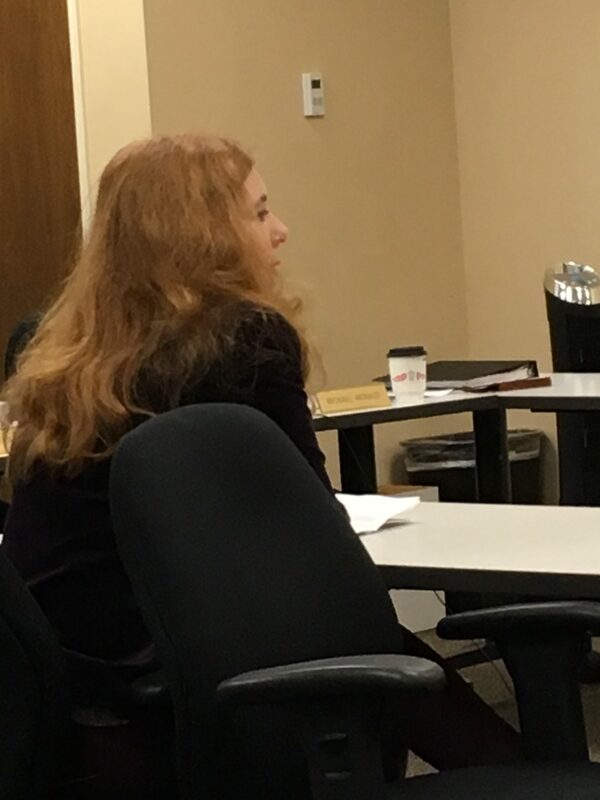 This morning, the usually sleepy Seattle City Employees Retirement System (SCERS) board meeting had its moment in the spotlight, as a large number of activists and a handful of local politicians showed up to urge the board to divest the city’s pension fund from fossil fuel companies. It was a thoughtful, respectful, and long conversation. A lot of listening happened, and much appreciation was extended in both directions for the depth of thought and energy that went into analysis and remarks. It was exactly the kind of conversation you wish every activists-meet-government conversation could be. But at the end of the day, the city won’t divest out of fossil fuels anytime soon. Here’s why. The Board’s primary responsibility, above all others, is to serve the interests of the members of the retirement system. That responsibility requires it to makes decisions in order to maximize the return on investment for the fund (and thus to the members). In practice, if faced with the choice between two investments, it must choose the one with the best return and risk profile. It may not prioritize any other factor over investment performance. If choosing between two investments with equivalent return and risk, it can consider other factors, including what are known as Environmental, Social and Governance (ESG) proposals. It may ONLY do this if the investments are equivalent. A trustee must act with undivided loyalty to the trust beneficiaries, to the exclusion of all other interests… In the context of this case this means that when the State transfers trust assets such as contract rights it must seek full value for the assets… It may not sacrifice this goal to pursue other objectives, no matter how laudable those objectives may be. Other facts and circumstances relevant to an investment or investment course of action would, in the view of the Department, include consideration of the expected return on alternative investments with similar risks available to the plan. It follows that, because every investment necessarily causes a plan to forgo other investment opportunities, an investment will not be prudent if it would be expected to provide a plan with a lower rate of return than available alternative investments with commensurate degrees of risk or is riskier than alternative available investments with commensurate rates of return. The fiduciary standards applicable to ETIs are no different than the standards applicable to plan investments generally. Therefore, if the above requirements are met, the selection of an ETI, or the engaging in an investment course of action intended to result in the selection of ETIs, will not violate section 404(a)(1) (A) and (B) and the exclusive purpose requirements of section 403. This morning the activists, led by 350 Seattle, Council member Mike O’Brien, and former Mayor Mike McGinn, argued that the city should divest its holdings in fossil fuel companies. 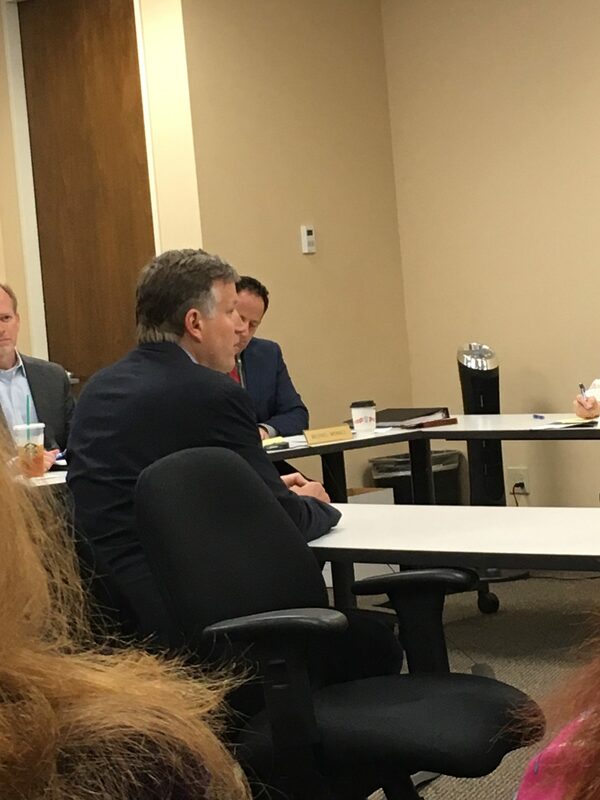 Council member Herbold stopped short of that but argued that SCERS should replace its outside investment consultant, NEPC, because of their unwillingness to engage on understanding the investment risks related to climate change. Some speakers gave the moral argument; many, including Herbold and O’Brien (who are both city employees and paid-in members of the retirement plan), argued instead that fossil fuel companies are in economic decline and a poor investment, and the current fossil fuel investments have lost the retirement fund $100 million over the past ten years. 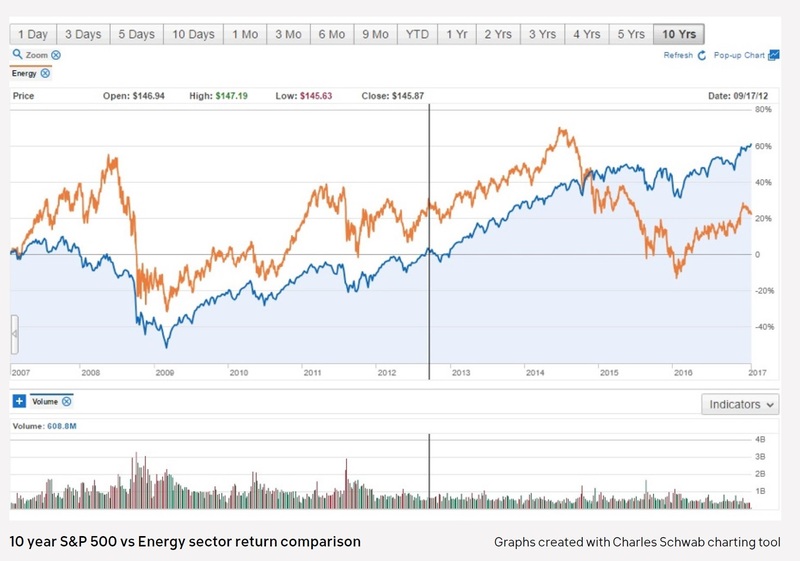 The blue line is the S&P 500 equities index; the orange line is the energy sector. If measured from the same baseline 10 years ago, the return on the energy investment is lower. Based on some assumptions of the size of the energy investments in the SCERS portfolio, Chen estimates the difference is about $65 million through February, and separately calculates another $35 million of additional difference since then. There are problems with this analysis. The first and obvious one is that Chen is cherry-picking the time interval, and just looking at the end points. You’ll notice that for the vast majority of the ten years, the energy sector outperformed the overall market. It’s only since mid-2014 that it has underperformed. If you were to look at just the period from January 2016 to the end of the chart, you’d see that recently the energy sector has generally outperformed the broader market (though in the past few months it has underperformed again). This points out the danger of picking start and end points and just measuring the change between them: it’s far too easy to game the system and draw the wrong conclusion, or to engineer the conclusion that you wanted to see. Nevertheless, this is far from proof that the energy sector has been a poor long-term investment. Further, keep in mind that the energy sector is also included in the blue line; this chart isn’t comparing energy vs. everything else; it’s comparing energy vs. energy+everything else. That means that when energy is underperforming, it’s also pulling down the S&P 500; but it also means that when energy is outperforming it’s pulling the S&P 500 up. Looking at the orange line tells you that the energy sector is more volatile than the overall equities market. That’s hardly surprising; it’s smaller and far less diversified, with a high affinity among the stocks included. But we have to apply the same principle to the broader portfolio as well: if we pulled the energy stocks (or a subset of them) out of the SCERS portfolio, we would decrease the diversification and thus increase the volatility — and the short-term risk. The point of diversification isn’t just to capture long-term economic trends; it’s also to balance different asset types and sectors so that when something goes down, something else goes up to offset it. If the investment goal of SCERS is to have a fully balanced portfolio (and it is), then surgically cutting out areas is counter-productive. So even if we said, for the sake of argument, that the energy sector and the broader market had equivalent returns, if SCERS’ choice is between a portfolio covering the entire market and one with a portion of the energy sector excised, the broad-market portfolio will have the lower risk profile — and the law says that the board must choose it. The board’s internal staff, external consultants, and Investment Advisory Committee all claimed that divestment would lower returns and increase risk, so there is no way the Board can approve divestment without breaching its fiduciary responsibility. But even if the returns were equivalent and the amount of stock being removed is small enough to not substantially affect the risk profile of the whole portfolio there are still problems, because of the way the SCERS portfolio is constructed and managed. Portfolio construction starts with a high-level statement of where you want to invest the funds in order to achieve a certain return and risk profile. Frequently at the topmost level it’s divided into public equity, private equity, bonds, real estate, and a few other classes. Within equity there are geographic distinctions: global, U.S., emerging markets, etc. And then there are specific sectors such as technology, transportation and energy. But eventually you need to start buying things, and at this point portfolio managers must make some key decisions. The first one is whether they want to buy stocks directly, or mutual funds that are collections of stocks. Directly buying (and monitoring, and selling) stocks is much more work; buying mutual funds passes the work on to someone else (the mutual fund manager), but allows you to invest in a geography, a sector, or both with one transaction, e.g. acquiring $1 million of a Emerging Markets Transportation fund. There are thousands of mutual funds out there, and most pension funds and nonprofit endowments consist primarily of them in carefully-crafted collections. But mutual funds come at a cost: the mutual fund managers take a certain amount off the top each year to pay their own salaries and other operational expenses. The exact size of the managament fee depends on the size of the team, the cost of doing research on potential stocks to invest in, and the reputation of the fund manager (a hotshot can ask for more, because investors believe they will get a higher return). Which brings us to the dirty secret of the mutual fund business: a fund manager can have a good run for a couple of years, but eventually they all revert to the mean. Almost no mutual funds perform better than the overall market over the long term. The best explanation for this is what’s known as the “efficient market” theory: that in a well-operating market where all investors have access to the same information and to the ability to make transactions, all the equities on the market will quickly move to the correct price for the information known about them. Profits are tied to market inefficiencies: if information is disseminating slowly, then an investor watching in the right place can get a short-term advantage — but not a sustainable one, because the information eventually makes it around to everyone. It’s also because part of the information that’s known about an equity is how much it’s being traded and activity attracts attention. That leads to a simple and obvious investment strategy: if over the long term no one beats the broad market, then you should invest in the broad market. This has led to the popularization of “index funds,” which are mutual funds that simply buy the stocks in popular indexes such as the S&P 500 or the Russell 1000. Since there are also index funds for specific countries and sectors, you can construct an entire portfolio out of index funds. Or just one: the S&P 500, or a global equities index fund. This is one of the biggest debates in large-scale investing: do you bet on specific “active” fund managers to beat the market (and on your ability to spot the outperforming fund managers), or do you bet on the market through “passive” index funds? Index funds have one other major advantage: they are trivial to run since you know exactly which stocks to buy, so the management team is small and the management fees are therefore very small. With less taken off the top, index funds give an even better return on investment. Here’s why this is important: SCERS has a very unusual investment strategy, which you could call “radically passive.” They have a high-level asset allocation which assigns percentages to specific asset classes, and then they invest most of the funds in index funds to cover those classes. Here’s their allocation as of their March 31st quarterly report. Of the $2.5 billion total funds invested, over $550 million is in one index funds (RhumbLine Russell 1000). Another $360 million is in a single non-US equity index fund (BlackRock MSCI World ex-US). $500 million of fixed income investments are in two index funds. There are some actively managed funds mixed in there, but they are the exception. This investment philosophy is an explicit decision by the board, both an acknowledgment that it’s tough to beat the market (especially when investing at large scale) and an attempt to keep overhead low. Not only do they save money on fund management fees, but SCERS’ own direct overhead costs are also very low. And it’s working: they are coming close to matching overall market returns (there will always be some discrepancies due to timing of buys and sells). But here’s the catch: because of its investment strategy, SCERS has little control over buying and selling of individual stocks for most of its portfolio. When you buy into a Russell 1000 index fund, you get a piece of all 1000 companies in that index. There’s no mechanism for saying “Give me all of them but Exxon.” That’s the price you pay for low fees, simplicity, and diversification. And it’s a fundamental incompatibility with the request from 350 Seattle. When your primary investment mechanism is index funds, you can’t divest from a list of 50 or 200 fossil fuel stocks without shifting out of index funds and into either “actively managed” funds or direct investment by SCERS’ own staff. SCERS could do that, but it would be a dramatic shift in investment policy and it would be extremely costly just in transaction fees, let alone the ongoing higher fund management fees and its own internal overhead. So even if a portfolio without fossil fuel stocks has the same investment return and the same risk profile as the current portfolio (which is doesn’t), the significant cost incurred by divesting would breach of the board’s fiduciary responsibility since they would not be maximizing the fund’s financial returns. the Council of Institutional Investors, which focuses on governance concerns. SCERS and other funds have been pushing companies to conduct climate risk assessments of their businesses and to publicly disclose the findings. They do this through shareholder ballot initiatives, as well as pressuring company executives directly. Not many of them pass at this point , though in the 2016 shareholder proxy season Exxon’s garnered almost 40% support. SCERS also placed BlackRock, which manages one of the index funds it invests heavily in, on “watch status” due to the way it had been voting in shareholder proxy ballots, and that has attracted wider attention within the pension fund community. The Positive Action Strategy is still young — it was started in February 2015. It will take some time to see how effective it is as an alternative to fossil fuel divestment. 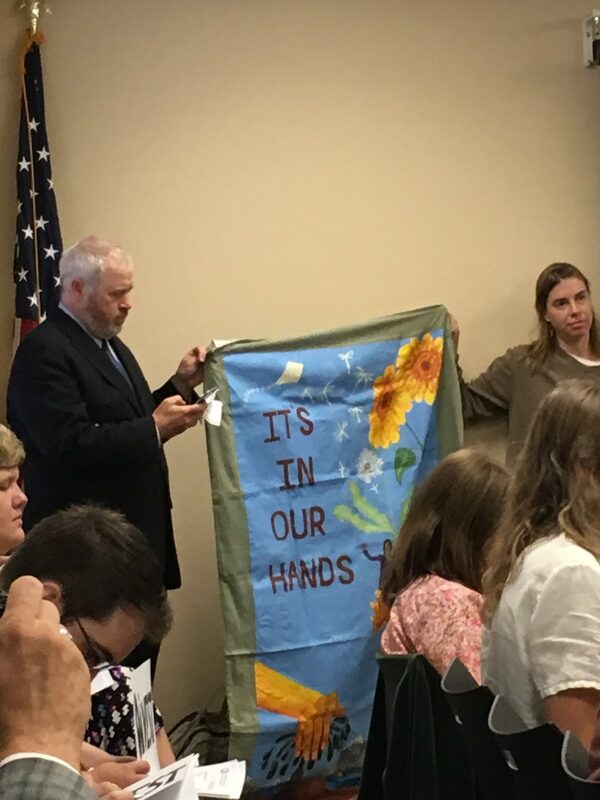 That isn’t the answer the activists wanted to hear, but as Burgess told me after the meeting, “In the end our hands are tied.” The barriers to SCERS divesting from fossil fuels are substantial and it’s hard to see a path to divestment any time soon. It looks like the plan is defined benefit. There is no risk to pension recipients if investments to not adequately perform, taxpayers would make up the difference. Of course CM’s like Herbold and O’Brien lsupport a fossil fuel divesture, there is no risk to their future benefits. The plan that has been in place for many years is indeed defined benefit. Last year they switched to a new defined contribution plan for any new hires. Kevin, this is a very thorough and logical explanation of a very complex comparison. Great job! And I agree with the conclusion. Echo @Greenlake View: super helpful. Thanks for taking the time.